Rojector puddle lights (x2). Genuine Audi LED p. For impressive sporty looks: the entry LED projects the four rings logo onto the ground when the front doors are opened. Display: 'Four Rings' badge. Only for vehicles with standard LED entry lighting . Changeable mode, 7 color,20 scan mode, with tailing effect and you can adjust scanning speed! You can automatically transform the order cycle for all modes, but also select a model and have a wireless remote controller to keep all functions. You can even connect the automotive brake light circuit, when brake, regardless of situation, burst into a flash, gives a warning. Super bright LED, minimal power consumption, long life! Waterproof, shockproof, anti-corrosion. Installation is simple. Connect the red line to 12V positive( ) and black line to negative(-) in your chosen circuit this does not destroy the original car circuit. Standard installation on all models of cars Operating voltage: 12VDC 7 Colors: RED, Green, Blue, Purple, Yellow, Aqua, White Package Conte. BMW Genuine L.E.D Door light projectors. Customise Your Vehicle with these trendy under door light Projectors. They are easy to fit and will make your vehicle stand out from all the rest with a surprise when you open the door. 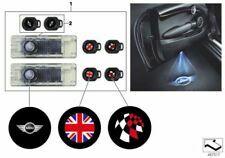 BMW Genuine M Performance Logo LED Door Projector Slides Set Pair. this is the slides only! All used parts and accessories are not covered by a warranty but are sold in good working order (unless otherwise stated). Sidelight LED Bulbs. You can even connect the automotive brake light circuit, when brake, regardless of situation, burst into a flash, gives a warning. Installation is simple. Attach this knight rider light to the grille or the rear window; Connect the red line to 12V positive( ) and black line to. This item is suitable for use with the genuine BMW Door Projector Kit and will fit all models where the projector kits are compatible. This item is suitable for use with the genuine BMW Door Projector Kit and will fit all models where the projector kits are compatible. Genuine BMW & MINI Parts. Description: This is universal high power 90 LED under glow puddle spot underbody light lamp 6000K xenon white color temp. light Votlage: 12V DC Waterproof design, easy installation Dimension: ~240cm (~95 inches) LED, ~60cm (~24 inches) in between each 9-LED module; with ~280cm (~110 inches) extension wire length Can fit any Cars, Trucks, Lorrys, SUVs, Vans, Trailers, RVs as Under Car / Door Puddle Light, or light under the bumper / grille, Daytime Running / Driving light (DRL) and Interior Lighting Low power consumption, high efficiency and energy saving. 20modes IP68 Waterproof 56CM 48LED bar light 5050 Car LED Knight Rider lights with Infrared remote LED Strip Scanner Lighting Installation is simple. Connect the red line to 12V positive( ) and black line to negative(-) in your chosen circuit this does not destroy the original car circuit. Standard installation on all models of cars Operating voltage: 12VDC Work voltage: DC12V Lighting color: 7 Colors: RED, Green, Blue, Purple, Yellow, Aqua, White Light source: 5050SMD LED LED Qty:48LED. Products Features: Brand new and high quality 12-LED Truck Emergency Strobe Light Latest ultra bright LED chip-set technology Adjustable angle to fit different screen Brackets and suction cups preinstalled, plug into a 12V cigarette lighter Easy to install Great for emergency workers, postal service, construction vehicle, security etc Products Specifications: LED light source: 12* 1W LED light Operating voltage: DC 12V Power: 5W Lighting modes: 16 Flash patterns Generally Bright Patterns Housing material: Strong PC Housing color: Black Operating temperature: -30 to 65°C Lifespan: 30000 hours. They project an image onto the ground next to the car using interchangeable slides. There are 4 motifs to choose from to perfectly illuminate the entry area in an individual style. LED DOOR PROJECTORS. ONE PAIR OF `QUATTRO` LETTERING DOOR PUDDLE LIGHTS FOR MOST MODELS. ONE PAIR OF `AUDI` LETTERING DOOR PUDDLE LIGHTS FOR MOST MODELS. Audi KeyFinderPRO. 'KeyFinderPRO' smartphone app connects smartphone and key ring. Audi Keyring KeyFinder. No more hunting for your keys: The electronic key ring from Audi connects to the 'KeyFinder PRO' app on your smartphone so you can find objects like your keys or wallet. 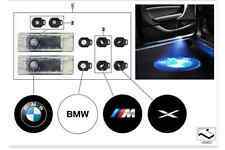 BMW Door Light M Paket LED 3D Logo. About the BMW Door Light M Paket LED 3D Logo Super cool LED Logo projection on the floor for BMW M3. When you open the car door will automatically turn on the high-definition projection and automatically turn off;. Changeable mode, 7 colour,20 scan mode, with tailing effect and you can adjust scanning speed! You can automatically transform the order cycle for all modes, but also select a model and have a wireless remote controller to keep all functions. You can even connect the automotive brake light circuit, when brake, regardless of situation, burst into a flash, give a warning. All of Thunderbolt ranger lamp uses super bright piranha LED u, minimal power consumption, long life! Waterproof, shockproof, anti-corrosion. Installation is simple. Connect the red line to 12V positive( ) and black line to negative(-) in your chosen circuit this does not destroy the original car circuit. Standard installation on all models of cars Operating voltage: 12VDC Wireless remote control: 1. Button. M Performance 4pcs Set. High Brightness LED, Power Consumptions Savage. 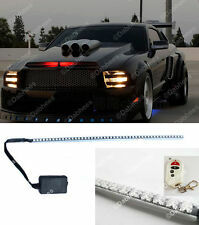 4pcs logo door lights(4PCS FOR 4 DOORS). Life span: more than 100,000hours. 2007-10 6-series E63 / E64 coupe / convertible (645Ci, 650i, M6). 1 x 50cm 30 SMD SUPER BRIGHT white led strip light. You get one 50cm strip of white led lights with self adhesive backing. THESE ARE THE BRIGHTEST AVAILABLE ON THE MARKET. THEY ARE 50cm LONG, 10mm WIDE AND ONLY 3mm HIGH. Car LED & Lights. Camouflage color is useful to hide and shoot the target by the suddenness of the attack. Car Wheel & Tyres. New 1 Folding Camouflage Slingshot Catapult for Athletics Outdoor Hunting Hunter Sling shot. For Audi A4 2003-2016. Life span: more than 80,000hours. High Brightness LED, Power Consumptions Savage. For Audi A1 2012-2016 (Not Fit For A1 2013). For Audi A3 2010-2016. For Audi A5 2008-2016. For Audi A6 2000-2016. Light Color: RGB. Strip Light Quantity: 4Pcs. 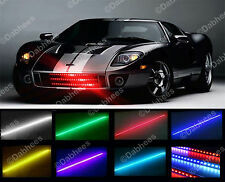 2 x LED STRIP LIGHT(60CM/24"). 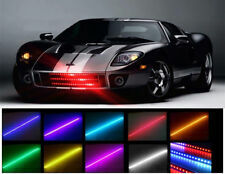 2 x LED STRIP LIGHT(90CM/35"). LED Quantity: 18smd 2 27smd 2. LED Type: 5050-SMD. Remote Battery: 1 CR2025 (included). 1 x Remote. Life span: more than 80,000hours. High Brightness LED, Power Consumptions Savage. For Audi A1 2012-2016 (Not Fit For A1 2013). For Audi A3 2010-2016. For Audi A4 2003-2016. For Audi A5 2008-2016. For Audi A6 2000-2016. 4pcs 90cm & 120cm car atmosphere lamp, create a charming atmosphere for. High quality flexible SMD 5050 LED strip lights, waterproof, anti-. Strip Light Size: 2 strip: 120 1.3 0.7cm / 47 0.5 0.3" (L W H). Specifications:Operating voltage: 10V-15VMax power rate: 12WLight color: 7 colors-Red, Green, Blue, Yellow (Green Red), Magenta (Red Blue), Cyan (Blue Green), White (Red Green Blue)Shell material: PVCLength: about 120cm (48") & 90cm (36")Item color: BlackProduct total weight: 680g / 1.49lbPackage weight: 802g / 1.77lbPackage size: 27 * 27 * 6.5cm / 10.63 * 10.63 * 2.56inPackage includes:2 * 48" (120cm) 72-LED waterproof LED strips2 * 36" (90cm) 54-LED waterproof LED strips1 * Control Receiver Box1 * Wireless Remote with 4 Buttons1 * User Manual MPN Does not apply Brand Unbranded Designer/Brand Unbranded EAN 4894462357576 ISBN 4894462357576 Manufacturer Part Number Does not apply. The LEDs automatically illuminate the door entrances with a choice of interchangeable graphics when the doors are opened. LED DOOR PROJECTORS. MINI part number:63 31 2 414 106. Used parts or accessories will be in good working order but do not carry a warranty. We are trusted and can help with your needs. These Audi Logo LED puddle lights are suitable for these car models The Audi Quattro Logo LED puddle lights are also available on our page if you would prefer a more specified variation of this product. For Audi A3 2010-2016. Life span: more than 80,000hours. High Brightness LED, Power Consumptions Savage. For Audi A1 2012-2016 (Not Fit For A1 2013). For Audi A4 2003-2016. For Audi A5 2008-2016. For Audi A6 2000-2016. 5D Black Carbon Fiber Gloss Autos Interior Trim Decor Vinyl Sticker Film 15"x40". New 8258 Car Radio 1Din Bluetooth LED Display Stereo MP3 Music Player FM AUX USB. Warm and cool interior ambient by different colors. For Audi A6 2000-2016. Life span: more than 80,000hours. High Brightness LED, Power Consumptions Savage. For Audi A1 2012-2016 (Not Fit For A1 2013). For Audi A3 2010-2016. For Audi A4 2003-2016. For Audi A5 2008-2016. For Audi A5 2008-2016. Life span: more than 80,000hours. High Brightness LED, Power Consumptions Savage. For Audi A1 2012-2016 (Not Fit For A1 2013). For Audi A3 2010-2016. For Audi A4 2003-2016. For Audi A6 2000-2016. Genuine Nissan Qashqai 2014-2017 Welcome Lights/Puddle Lights under Sill New! Nissan Qashqai J11 2014-2017. Two stripes of LED Lights 1 x left hand 1 x right hand. Light Color: RGB. 4pcs 90cm & 120cm car atmosphere lamp, create a charming atmosphere for you. Due to lighting effects, monitor's brightness, contrast settings etc. Installation area: car bumper, inlet grid, car interior, car rear, car bottom, etc. Genuine MINI LED door projectors. Genuine BMW & MINI Parts. These lenses suit the MINI R50, R53, R56, R56 LCI, F55, F56, R55, R55 LCI, F54, R52, R57, R57 LCI, F57, R58, R59, R60, F60 and R61. Led ambient lights for bmw f30 / f31 interior door panel decorative trims light atmosphere lamp lighting upgrade. Warm and cool interior ambient by different colors. Light Strip Material:Carbon Fiber. Light Color: RGB Multi-Colors. 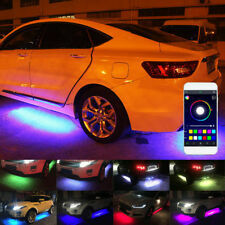 MUSIC DECORATION - The Kit designed to be simple, yet also provides elegance inside the car when driving at night or enjoying music.And because it has sound sensor, the under car glow system synchronize with music beat.